The Whitney Blackfly Band is looking for all the young aspiring rock stars in town! Camp Bongopix is excited to announce our brand new SCHOOL OF ROCK! The School of Rock is Whitney’s musical kids jam for ages 3 and up. 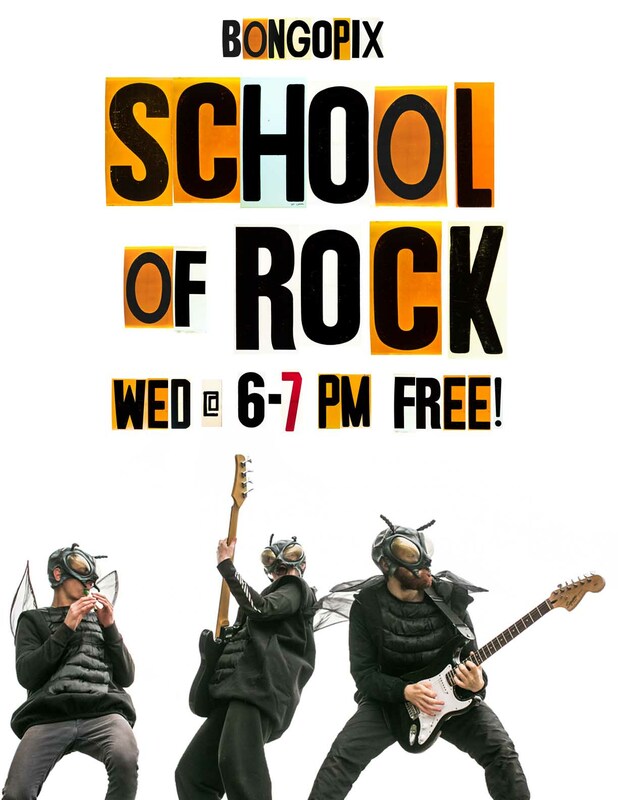 School of Rock is FREE! Parents are welcome to join or they can simply drop off their kids. School of Rock will take place every Wednesday from November 2016 until the last Wednesday of March 2017. If there are any changes to our jamming schedule then we will announce it on our Facebook page. We will jam for one hour, 6pm-7pm. The jam is at The Common Room – Whitney’s coolest jam room. It is located at 50 Galeairy Lake Road. Park your car anywhere in the parking lot. If the lot is full you may park along the road. We play high-energy songs that carry positive messages and themes. We play everything from classic Rolling Stones/Beatles songs, our favourite country songs by Johnny Cash and John Prine, silly kids songs, and of course – we improvise a lot too! Just drop in! You can contact us via Facebook if you have any questions. YES. We are a positive and safe space. We believe that parents have the right to record their special memories so we allow pictures and video at the jams. Feel free to share your videos and pictures with friends! Why did you start School of Rock? We love Whitney because this is a musical town. We’ve been inspired by so many talented local musicians. We want to grow and celebrate the town’s unique musical culture with the younger generation. And of course, kids LOVE to jam! We believe that music is a great educational tool that teaches valuable skills such as: team work, self confidence, acceptance, socializing, and creativity. We want to show kids that music is more than just YouTube and Spotify: music is alive and it brings people together.